HealthOffice® Anywhere's integrated solution provides scheduling, documenting, reporting and compliance functionality that equal or exceed all requirements of local, state, and federal guidelines in a single, easy to use program and contain all of the components every school district must have in order to be accurate, compliant, secure, accountable, and fiscally sound. HealthOffice® Anywhere is IDEA, FERPA and HIPAA Compliant. All of the state-specific billing procedure codes and modifiers for each job classification are recorded as part of the initial configuration and the software automatically restricts use of specific codes to each billing provider to her/his specific job position that was assigned as part of each user&apos;s initial set up. 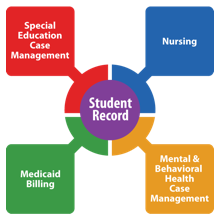 Keeps track of parent permissions and will not allow a claim to be submitted if the district does not have appropriate parent permission on file. The system will not submit a Medicaid claim for a provider needing a supervisor&apos;s review of the documentation unless the approval is documented and attached as part of the event record. The system notifies the particular nurse as well as the Nursing Supervisor if the nurse&apos;s license has expired (or the renewed license date has not been entered into the system. The system will not allow a claim to be submitted for any scheduled event where the student has been recorded as absent. Request a demo to learn more about our integrated solution.